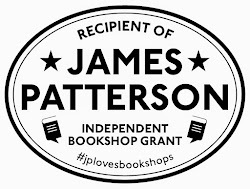 This week we have had a special kind of magic in the bookshop, thanks to #IBW2013 - Independent Booksellers Week. Thanks to unprecedented support from authors, publishers and - particularly - our customers, we've felt able to put on an ambitious programme of events for July, and we hope that you feel able to come and take part. The shop has been transformed - we thought you might like to see the results! Tomorrow (Saturday 6th July) is something we've never done before - an author take-over of the shop. Three children's authors (Paula Harrison, Fleur Hitchcock and Helen Peters) and the publisher Nosy Crow are taking over the shop, serving at the till, recommending their favourite books - and talking to customers young an old about writing, getting published and what it's like to be an author. The shop is developing a distinctive 'Nosy Crow' feel to it, but - honestly - we have no idea how this is going to pan out. But we'd love you to come along at some point during the day and find out with us! On Thursday 11th July, we have realised a long-held dream of luring Salley Vickers to Abingdon for a very special evening at Abingdon's Guildhall. The author of 'Miss Garnet's Angel' will be in conversation with Mark Thornton and the audience, answering questions about her writing life and talking about her latest book 'The Cleaner of Chartres'. A word-of-mouth sensation, a bookgroup favourite and an author as well-known for her beautifully observed books as well as being an engaging and delightful speaker: we hope you can help us give Salley a special welcome to our town. Finally, on Tuesday, July 23 we are inviting young children to bring their teddy bears to meet Jane Hissey and the original 'Old Bear' at a ‘Teddy Bear's Picnic’ in our courtyard garden. Jane is best known for her series of children's books ‘Old Bear and Friends’ which became the basis for a BAFTA award winning television series ‘Old Bear Stories’. Thanks again to the publishers and authors who have made all this happen. Why not come along and take part?